All items listed below feature the Thumbprint Signature logo printed in red and black. 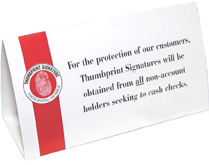 Decals, teller window display signs and statement stuffers are available. Prices listed below do not include shipping, state or local taxes. The Touch Pads have a shelf-life of 18 months or a minimum or 400 impressions. Participants should order enough for all tellers and drive-up staff. Minimum order of 10 pads. These 3.5" x 7.5" brochures explain the mechanics of the program. Participants should distribute them as a public service announcement to all account holders, plus have plenty available for anyone who might have questions about the program. Please order statement stuffers in increments of 500. Participants should post decals at all entrances to let people know that they are participating in the program and to warn potential criminals that their crimes will not go undetected. Decals might also be posted at drive-up stations. These 6" x 3" tent-style display signs should be posted at all teller windows as an additional reminder that the institution is a participant in the program.